A Great Visit to Academy Street Bistro in Cary! Many people don’t realize this but Cary has many hidden culinary gems that delight local foodies. 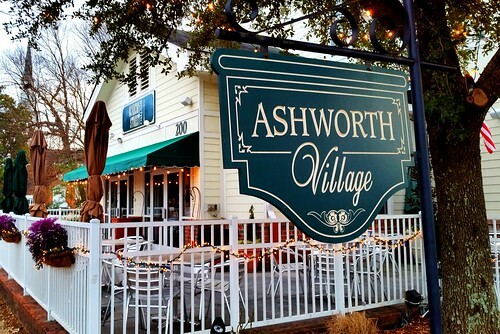 I don’t make it there often enough to enjoy them all, but last month I had the opportunity to celebrate Valentine’s Day with my wife over a wonderful dinner at Academy Street Bistro in Cary’s Ashworth Village. The restaurant has a nice bistro vibe and offers both indoor and outdoor seating. The kitchen is run by Chef Brian Fitzgerald who is committed to using additive & nitrate free poultry, meat, & fish and tries to locally source ingredients from local farmers whenever possible. This is something I really value when looking for place to dine. Upon our arrival my wife and I were promptly seated in a nice booth by the window in the dining room. Our Valentine’s Day dinner started off great with a small plated “Amuse-bouche” which is a chef’s choice single bite hors d’œuvre. 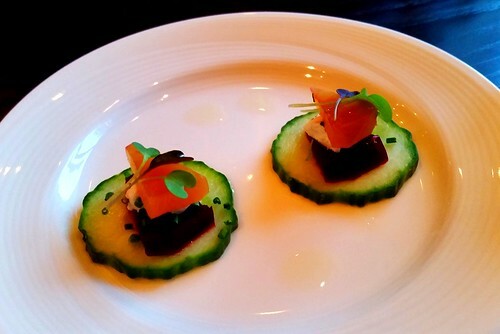 Chef Brian had selected a combination of beats, cucumber, and crème fraiche presented beautifully. It was the perfect beginning to our special night. As an added plus the waitress was extremely knowledgeable about the wine list and gave us great advice for selecting the perfect wines to go with our dinner. If you asked me when first walked into Academy Street Bistro I would have told you that I’m not a fan of mushrooms. All that changed when I took a chance and ordered the wild mushroom bisque with crème fraiche & chives for my first course. 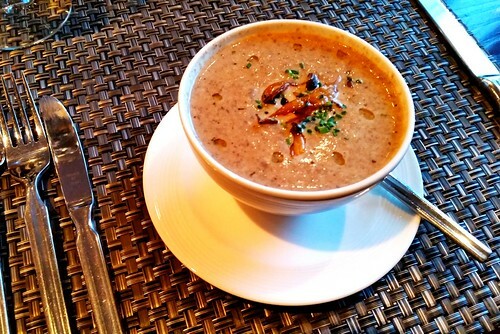 It was a hearty flavorful bowl that had a wonderfully smooth texture. After the first spoonful it completely changed my view of mushrooms. Who knew they could be so delicious? My wife started off with the sautéed rock shrimp and asparagus risotto with shaved parmesan cheese. This dish really won her over. 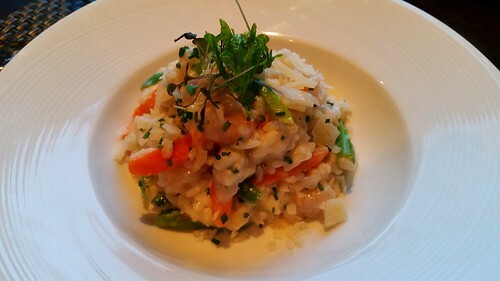 The risotto and shrimp were cooked perfectly and she quickly informed me that she would like to go back to Academy Street in the future simply to enjoy this dish again. We were equally impressed with our main courses. 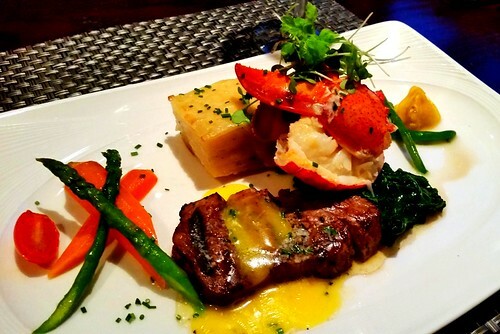 My wife ordered the surf & turf grilled petite filet mignon and half steamed lobster au gratin potatoes, baby vegetables, béarnaise sauce. The presentation of this dish was excellent and the meat was cooked perfectly. My wife was also happy with the portion sizes. I’ve actually never had béarnaise sauce on a filet mignon before but she let me try a piece and I was an instant fan. It added a nice twist to an already excellent cut of meat. 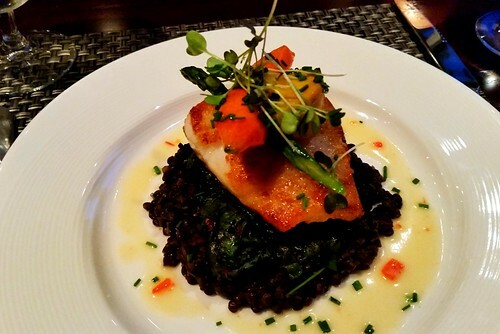 For my main course I ordered the pan seared chilean sea bass with beluga lentils, sautéed swiss chard, red peppadew beurre blanc. I love sea bass and this was a nice fresh piece that was perfectly cooked. Again, the portion size was just right. I’m usually not the biggest fan of lentils but I trusted the chef’s choice and was rewarded as I found their earthy flavor went really well with the dish. Much like my wife’s surf and turf entree there wasn’t a speck of food left on the plate when I was done. 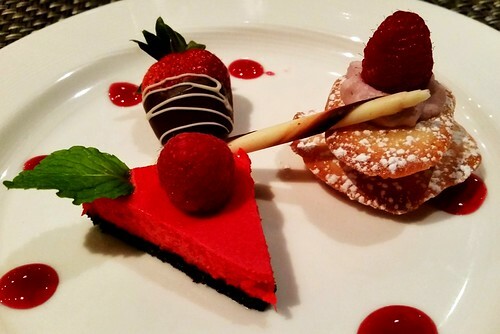 For dessert we shared the Valentine’s Day Tasting Trio comprised of raspberry-vanilla mousse w/ homemade cookie wafers, a chocolate dipped strawberry and raspberry cheesecake. The dessert choices which prominently featured berry flavors (which we both love) were the perfect ending to an excellent dinner. We both enjoy sharing dessert and having a few different treats to share made it even more fun. 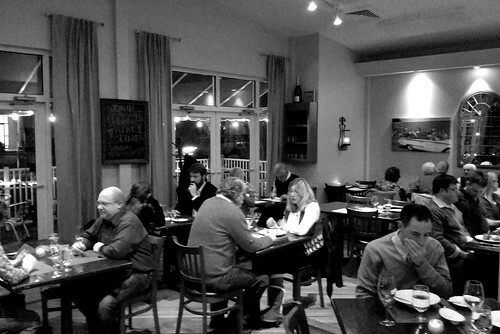 Academy Street Bistro was the perfect place to enjoy our Valentine’s Day together. After spending an evening there I think it is a great spot for both special occasions or a casual night out with friends. The menu changes with the seasons and offers a variety of choices. Ranging from shrimp and scallops to filet mignon. They even offer a delicious black angus burger and have a very reasonably priced menu for children. Their lunch menu is equally impressive including a half wrap of the day, cup of soup, and small salad for just nine dollars. And if your are looking for a new brunch spot serve an excellent Sunday brunch as well. Whether you live in Cary or are simply a Triangle Foodie looking for a new place to try and I recommend a visit to Academy Street Bistro. 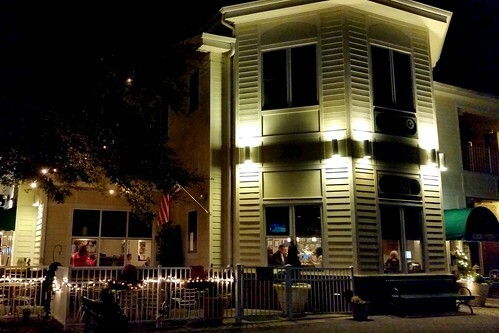 I’m looking forward to going back again soon once the weather warms up to enjoy dining on their outdoor patio. In the meantime, they have a few special events coming up that are worth checking out. I’ve provided some additional details below concerning their upcoming Easter Brunch and a special Beer Dinner featuring local brewery LoneRider Beer. Menu features customer favorites from the Brunch menu plus, Chef Brian’s special Jumbo Lump Crab Cake Benedict, Smoked Salmon Benedict, Roasted Leg of Lamb and more. Fantastic four course dinner featuring Kobe Beef Sliders, Veal Bratwurst, Roasted Applewood Smoked Bacon Wrapped Quail, Herb Mustard Crusted Rack of Lamb and more. Each course paired with a different LoneRider Beer, including Hops You Rode on IPA, Shotgun Betty Hefeweizen, Eve Amber Ale, Sweet Josie Brown Ale and Tombstone Reserve-Oak Aged Rye Stout.